Many common signs of aging—forehead lines, crow’s feet, brow furrows—can be addressed using non-surgical approaches. BOTOX® Cosmetic, a minimally invasive injectable solution, has become one of the most popular anti-aging techniques available. 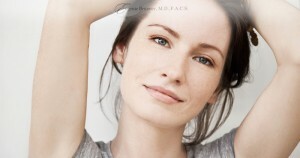 Curious about what BOTOX® Cosmetic can do for you? Here’s a helpful resource that answers several common questions about this product. For a customized treatment plan, contact us today for a consultation with our double-board certified facial plastic surgeon, Dr. Eugenie Brunner. What areas of concern can BOTOX® Cosmetic treat? As a facial rejuvenation method, BOTOX® Cosmetic is designed to reduce the appearance of fine lines and wrinkles on the forehead, around the eyes, and between the brows. BOTOX® injections can also be used to minimize creasing in other areas of the face—in certain cases. Dr. Brunner will customize your treatment plan to suit your unique needs and goals. Recovery time is typically minimal with cosmetic injectables, including BOTOX® Cosmetic. You may experience some tenderness, bruising, and mild swelling at the injection sites, which should subside quickly. You are welcome to apply cold compresses to reduce any swelling or redness, or to cover up these symptoms with makeup. You should be able to return to normal activity immediately following treatment. Dr. Brunner prioritizes your care and comfort. We utilize ultra-fine needles and cold compresses to enhance your experience. We can also administer a local anesthetic to further minimize discomfort. Most patients find the process quick and easy. While dermal fillers can achieve nearly instantaneous results, BOTOX® Cosmetic can take slightly longer—about a week or two—for the final results to appear. Depending on your singular anatomy and rate of healing, BOTOX® Cosmetic may last anywhere between about four and six months. You can extend the benefits longer with occasional touch-up treatments from our office. Everyone ages at a different rate, and some people begin to see signs of aging in their 20s while others may not notice them until their 40s. You must be 18 years of age or older for BOTOX® injections. Younger patients may wish to try laser skin resurfacing or another facial rejuvenation procedure if their aesthetic concerns are mild. Dr. Brunner will provide guidance during your initial consultation. For more information about BOTOX® Cosmetic, or if you would like to schedule a consultation with Dr. Brunner, please contact our office today.